For 2017, the United States was the EU’s largest partner for exports (20 % of total extra-EU exports) and second largest for EU imports (14 % of total extra-EU imports), after China (20 %) according to Eurostat. 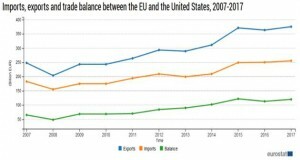 For the period 2007 to 2017, the EU had a trade surplus (meaning larger exports than imports) with the United States. This trade surplus has fluctuated slightly, but has increased overall during the period and reached EUR 120 billion in 2017. For both EU exports and import with the United States, “machinery and vehicles”, “chemicals” and “other manufactured goods” dominated. Together these manufactured goods accounted for 89 % of the EU exports and 84 % of imports to and from the United States. Looking more in detail, the most exported product to the United States from the EU is “motor cars and vehicles”, while the most imported product to the EU from the United States is “aircraft and associated equipment”. Among the Member States, the United Kingdom (EUR 54 billion) was the largest importer from the United States, while Germany (EUR 112 billion) was the largest exporter to the United States in 2017.